At Grazin’, a 1950s-style diner in Hudson, N.Y., owners Dan and Susan Gibson, together with their daughter and son-in-law, serve only the best. For them, that means delicious burgers, fries, shakes and sodas made from local, seasonal, organic and biodynamic ingredients. The restaurant uses only 100 percent grass-fed and finished black angus beef raised a few minutes away at Grazin’ Angus Acres’ farm. It also takes diners on a mini tour of the local agricultural scene, featuring a variety of ingredients from nearby producers. Several years ago Grazin’ earned the distinction of being the first Animal Welfare Approved (AWA) restaurant in the country. What criteria did the restaurant have to meet in order to earn this certification? One of the really cool things about AWA, is that everyone can see the standards we are held to by visiting www.animalwelfareapproved.org. The basic premise is that animals must be able to behave naturally and be in a state of physical and psychological well being. 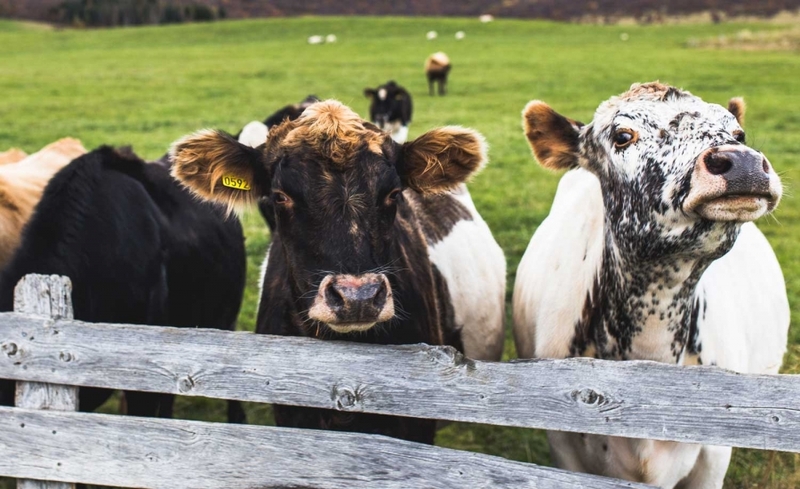 Essentially, from butter to beef, all of our animal proteins come from local farms that provide constant access to pasture, and are held to the highest animal welfare standards as recognized by The World Society for the Protection of Animals. AWA is also completely independent, taking no fee from the farmer. Folks who care only about the livestock fund them. When it comes to environmental awareness and humane treatment of animals Grazin’ is light years ahead of many restaurants. Are there any areas in which you’d still like to improve? We are disappointed that there aren’t more AWA restaurants. So, we are looking to take Grazin’ on the road! In fact, we recently signed a lease to open the next Grazin’ in TriBeCa, New York City. Hopefully, this is just the beginning of many more to come throughout the U.S. Along with a heavy emphasis on local and organic foods, Grazin’ also uses biodynamic ingredients when possible. How does biodynamic farming differ from standard organic practices? Biodynamic farming is a form of organic farming that was developed by Rudolf Steiner and is considered to be one of the first sustainable agriculture movements. Both organic and biodynamic farming are done without the use of chemicals (pesticides, herbicides, etc. ), but biodynamic farming goes one step further. It takes a more holistic approach, viewing the entire farm as one interrelated system and treating it based on careful observation, and with the use of minerals, herbs and astrological influence. Instead of cows raised primarily on corn, Grazin’ Angus Acres beef is 100 percent grass-fed, which is a rarity. What are some of the health benefits of raising grass-fed beef? The health benefits are staggering! Grass-fed and finished beef contains plenty of omega-3 fatty acids. In fact, our beef has as much omega-3s as wild salmon – and it’s a lot easier to get our meat than truly wild caught salmon. Grass-fed and finished beef also increases beta-carotene, Vitamin E and conjugated linoleic acid (CLA), all which have been shown to have significant health benefits. How does the Grazin’ menu fluctuate with the seasons? One of the biggest ways our menu fluctuates with the seasons is with our use of produce. You won’t find a tomato on your burger unless we have grown it in season on our farm. A tomato from Mexico in January, even if certified organic, doesn’t work for Grazin’. And while a great burger with organic fries is never out of season, we do feature special cuts, like lamb chops, pork chops, short ribs and other special entrees during the winter months. The majority of your ingredients travel a very short distance to the restaurant from a variety of local farms, making Grazin’ significantly more sustainable than most burger joints. Have you found any other ways to decrease the restaurant’s environmental impact? We are always looking for new ways to reduce our carbon footprint and recycle or compost as much as possible. For example, we save food scraps (such as bread, milk, greens, fries, etc.) and bring them back to the farm for our pigs. Additionally, all of the paper products in the restaurant are made from recycled and/or biodegradable materials. Our to-go cups and disposable silverware are actually made from sugar and corn husk. What is Grazin’ Angus Acres’ portable egg mobile? Nature has taught us that it’s always been herds grazing followed by birds to clean up! That’s the way we farm. Our cows graze off an area and leave behind a tremendous amount of organic material. Immediately, flies touch down on the patties. Three days later, the egg mobiles are moved in and the chickens go to work scratching apart the manure to eat the emerging fly larvae, spreading the manure in the process and allowing the grass to grow. And the best organic fertilizer we know of is chicken manure. It’s a perfect symbiotic relationship. Cattle graze it off, chickens make it grow. As a side benefit, the chickens also give us the best tasting eggs possible. Some have referred to farm to table eating as a foodie fad. What is your take on the movement back toward real, local foods? Do you feel seasonal, farm to table dining is here to stay? If you don’t know where your food comes from, then you deserve what you get! Whenever possible, shake the hand that feeds you. Local tastes better and it’s better for you, the environment and your economy. Farm to table dining will grow as more and more become aware of its benefits vs. industrial farming. Do you have any advice for people who want to make some simple changes that will yield the greatest benefit? First, know where your food comes from and take the time to develop a relationship with your local farmers. AWA has actually put together a piece on confusion surrounding labels that can be studied from their website. What you think of when you hear ‘free-range’ isn’t at all what the term legally means. Your health is at risk. Taking the time to better understand can lead to a huge impact on your overall health and well being, so invest in yourself!